Adam takes a vacation to Robert Altman’s Gosford Park and finds murder, genealogy, and much more. The 2001 Oscar Winner has been released in a beautiful new Blu-Ray by the folks at Arrow Video and their Arrow Academy Label. One would think that Gosford Park would be the kind of boring stuffy affair full of tweed and repression that audiences see trotted out every Award Season. Well, one would only be partially correct. There is an awful lot of tweed. Director Robert Altman puts his trademark free-wheeling-overlapping-dialog approach to this venture. Gosford Park in Altman’s hands is such a unique spin on a tired and true genre one will have to blink twice to realize they watched a costume drama. The film, concocted by Altman and Actor/Producer Bob Babalan as a murder mystery Upstairs/Downstairs drama mashup is the sort of unexpected delight that one wish would happen more often with this type of material. The movie told over a long weekend tells multiple B-Storylines throughout like much like improvisational jazz, moving in and out of stories within a scene. Though multiple storylines, the film never feels like a pastiche rather a tightly constructed film that manages a few divergent plots that manage to come back beautifully by the film’s end. The film’s biggest weapon is its sharp adroit screenplay by Julian Fellowes. The script may seem like a familiar concept, it’s because Fellowes has used the Upstairs/Downstairs drama so effectively a decade later. Fellowes is the creator of Downton Abbey. Though many will find the film to be less soap-y and more grounded. The script deftly juggles those multi-storylines with so much style and accuracy that Fellowes won just about every single writing award that season including the Oscar for best original screenplay. Just as impressive as the Script is Gosford Park’s cast. Altman and Casting Director Mary Selway have put to get her a who’s who of British Heavyweight Actors and sublime American Actors. From Academy Award Winners Helen Mirren and Maggie Smith to English Acting Royalty Michael Gambon, Kristen Scott-Thomas and Clive Owen to Character Actor Supreme Bob Babalan, Charles Dance, Tom Hollander there isn’t a bad performance in the entire film. One would be hard pressed to find a film with a better cast. The audience will find themselves watching this movie more than once if only to watch these actors and their background work. There is some truly inspired acting on display. Hollander may take the crown as a tickish in-law that only wants to ensure a business deal no one has the heart to tell him isn’t going to happen. Watch the actor slowly break down in the background. Dense cannot adequately describe how much going on in each scene. 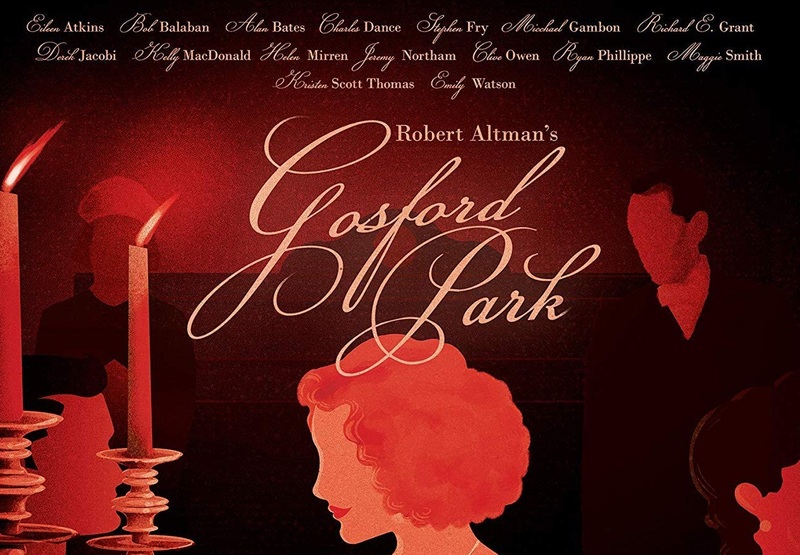 Gosford Park is Altman’s last great film. Astute, funny, and as sharp as a dagger, the film should not be slept on any longer. The film boasts a brand new 2K restoration from a 4K scan, carried out by Arrow films exclusively for this release, supervised and approved by the director of photography Andrew Dunn. The debut of Gosford Park on Blu-Ray is a welcome one. The DVD for its time and era was a great disc. Arrow has complimented that disc with a perfect representation of the Visual Style of Gosford Park and Altman’s work as a whole. Godsford Park like many of the director’s work was filmed through defuse lighting, which can cause a sharpness issue. This issue has been sidestepped, though many that are not accustomed to Altman’s work may find this a defect when in fact it is not. Bravo to Arrow on such a beautiful transfer. They have included not one or two but THREE commentaries to go through. The best is Julian Fellowes commentary that has nothing but love for the material divulging facts, anecdotes, and a few wittism. The Critics commentary by Geoff Andrew and David Thompson is also another great fact driven commentary. The last with Altman joined by Stephen Altman (no relation) and producer David Levy is the driest of the three and a semi-letdown. Altman does not seem engaged here as he had been in other commentaries (listen to his Commentary on Criterion’s edition of The Player which is an all-time great commentary). Executive Service is a 21-minute featurette interview with Producer Jane Barclay that reviews the production and how it came to be. Acting Upper Class is an 11-minute featurette interview with Natasha Wrightman. Wrightman who plays Lavinia discusses how she came to join the project and Altman’s process. The Making of Gosford Park is an archive featurette that runs about 20-minutes. The featurette does a great job in the short amount of time giving us an overview of the production. Keeping Gosford Park Authentic is another archive featurette that runs around 9-minutes the various technical advisors that came onto the film to help keep everything… well authentic! Q&A Session is a post-screening Q&A with Altman and the cast that runs around 25-minutes. It’s a great time to be had and similar to Altman’s work as it’s a free-wheeling affair that includes Fellowes, Kelly McDonald, Ryan Philippe, Helen Mirren, and Jeremy Northam. The deleted scenes amount to about 20-minutes of run time and quite honestly all could be put back in and not interrupt the flow of the film. There is an optional commentary by Altman on these scenes discussing why he took them out. Rounding out the special features is the Trailer that does not really do a good job at expressing how uniquely entertaining film this is. Gosford Park is a great film. Arrow Academy has delivered again with a beautiful transfer and a wealth of extras. One can only hope that more people revisit this truly great Altman film. HIGHEST POSSIBLE RECOMMENDATIONS!! !